In January 1919, eight families received a letter from Major Lean, Officer-in-Charge, Base Records in Melbourne. It enclosed a photograph, taken at San Stefano prisoner-of-war camp in Constantinople. San Stefano was located where Istanbul international airport now stands. All the men returned. I have previously told the stories of some of them, listed at the end of this pot. 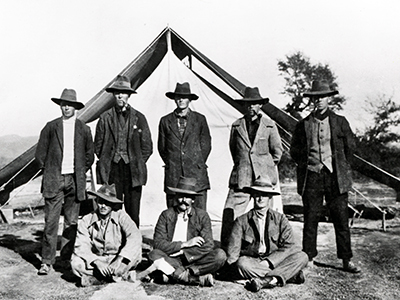 This post is about Private Joseph Cahir 14th Battalion (standing far right), Private Harry Foxcroft, 14th Battalion (sitting far right) and Trooper Robert Malcolm McColl (seated, centre), 2nd Australian Light Horse Regiment. Twenty-five New Zealanders were taken prisoner at Gallipoli: one on the first day, 21 at Chunuk Bair on 8 August, and three at Hill 60, 21-28 August. All were wounded when captured; six would die as prisoners of the Turks. Private Thomas Burgess was captured on 25 April – he died and is buried with two other Kiwis at Haidar Pasha cemetery in Istanbul. He died at a hospital where Lieutenant-Colonel Charles Doughty-Wylie (Gallipoli VC) worked with the Red Cross before the war. An account of the capture of the heroic Wellingtons on Chunuk Bair on 8 August is provided by Private Reginald Davis, and of the horrific conditions endured in the camps by ordinary soldiers by Private William Surgenor, both of the Wellington Battalion. Some 1,358 Indian soldiers died at Gallipoli with 3,421 wounded. At the third battle of Krithia 3/4 June 371 men of the 14th Sikh regiment were killed or died of wounds.